If a card(s) is added from the Main Deck to your opponent's hand, except during the Draw Phase (Quick Effect): You can send this card from your hand to the GY; for the rest of this turn, cards cannot be added from either player's Main Deck to the hand. The character holding the bird has a strong resemblance to Night's End Sorcerer. This card is one of the very few cards in the game with an Ampersand (&) in the card title. 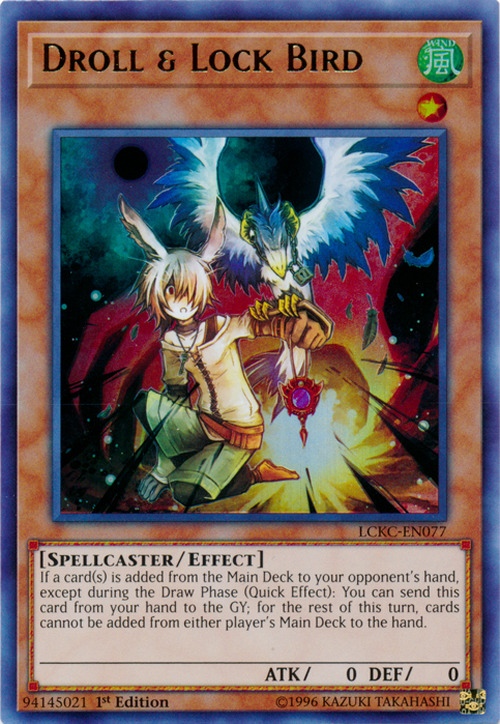 It can be assumed that Droll is the name of the Spellcaster seen in the card artwork and Lock Bird is the bird on the arm of Droll. The lock around the bird's neck in the card artwork makes it seem like it fits with the cards Key Mouse, Lock Cat and Chain Dog. This card bears a similar name to Droll Bird, though there is no relationship between the two cards - they do not share a name in the OCG, with Droll Birds name being Speak. You do not activate this effect in Chain to an effect wherein your opponent adds to his hand; you activate this effect after you finish resolving an effect wherein your opponent added to his hand. Drawing cards is also considered as adding a card to the hand from the Deck. You can also activate this effect during your opponent's turn.